↑ 2.0 2.1 2.2 2.3 2.4 "Dugongs". Department of Environment, Heritage, Water and the Arts. Australian Government. Retrieved 2010-02-07. ↑ 3.0 3.1 3.2 "Dugong Biology and Life History". 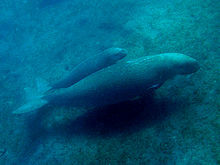 Dugong. Great Barrier Reef Marine Park Authority. Retrieved 2010-02-07. ↑ 4.0 4.1 "Dugong". Australian Museum. Retrieved 2010-02-07. 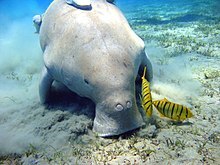 ↑ 5.0 5.1 "Dugong Movements". Great Barrier Reef Marine Park Authority. Retrieved 2010-02-07. This page was last changed on 22 September 2018, at 23:51.